The idea of Lamoraga started not too long ago in Andalusia, the Spanish region that covers most of the southern part of the Iberian Peninsula. The region’s history dates back many 1000s of years. From the Romans, North African Tribes, such as the Moors, to the British and the French, you notice the social influences in the Andalusian cuisine. The mixture of cultures, a great coastline along the Mediterranean Sea, and the indigenous foods to this region offer complex and very unique flavors to its cuisine. There, a handful of chefs decided to create a contemporary lifestyle restaurant, where one can enjoy recipes that are essence not only of Spanish, but of an international gastronomic culture. 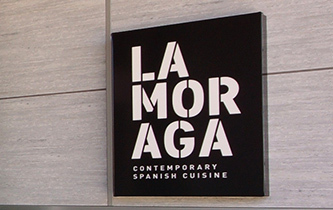 Lamoraga was born, with its Andalusian roots loosely translates to: The Barbeque on the beach. A few years later, in 2013, a small group of well-travelled international “foodies and wine lovers”, dined at a Lamoraga in one of the Spanish locations. 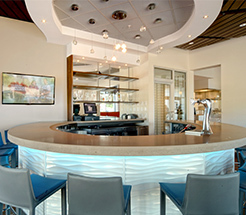 With roots in the USA, specifically Naples, FL, the idea of offering this concept to the American market started to take course. The process of selecting a location and building one of the finest restaurants in the area began. Nestled halfway between Olde Naples and Vanderbilt Beach, Lamoraga is a freestanding building on Tamiami Trail and wows anyone pulling up to the front doors. From the beautiful interlocking paver driveway, exterior tiles from Germany, interior tiles from Spain throughout, custom made, hanging wood ceilings from Canada, a tree that was milled into a 30 foot chef’s dining table, a concrete bar top with sea shells in bedded in it…. The attention to detail can be seen and felt throughout. Welcome back and if you have not seen us, come on in and be amazed.